How to Locate Archived Conversation in Messenger: Let's get started with how I found my archived conversations on Facebook Messenger. For those of us that wish to know, bear in mind that archiving a conversation in Messenger, hides it from your inbox until the next time you chat with that person. 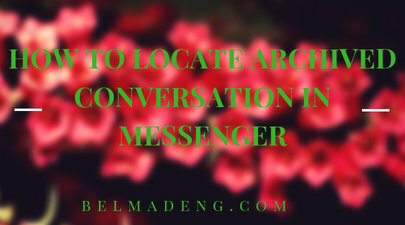 In this tutorial, Belmadeng.com will show you how to find a conversation that you've archived in Messenger. You can click here to see how to archive conversations on Messenger. 1. From Home, tap Search at the top. 2. Search the person's name in the search bar. 3. Tap the person's name to open the conversation. Bear in mind that you can unarchive the conversation and add it back to your inbox by sending the person a new message.